After losing our Doberman of 13 years we decided to look for a smaller breed of dog. With this in mind, we knew we wanted a tough, energetic dog to keep pace with our life style. 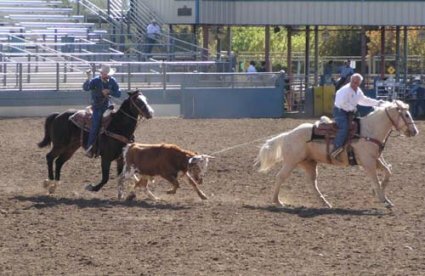 The intelligence of a JRT and the competitive drive to hunt was as challenging, as are our sports of team roping and barrel racing. After reading many books and researching the JRT, we knew this was the dog for us. After searching for that perfect terrier, we acquired our first terrier in 2000, Quail Oak Cowboy Jack. The lessons we were about to learn! I was amazed by the intelligence of this little dog. I had to challenge myself to teach him agility, obedience, tricks, and to ride horses. While he is the best at competition, we learned to high five each other. Unbeknownst to me, he was slowly teaching me the characteristics of this type of terrier. Now with our second Jack Russell, Wild Oats Mila Mae, we are much wiser to their adorable, charming ways. After going to trials and meeting other Terrier enthusiasts, we realized that having two of these feisty little terriers was not enough for us. Some call me as energetic as they are. Four years later, the Diggin' West Challenge was formed. 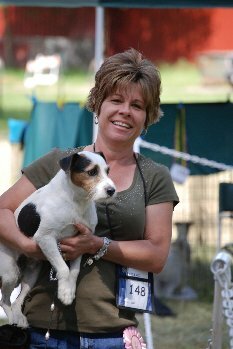 The Diggin’ West Challenge is a Jack Russell terrier dog trial that is sanctioned with the JRTCA (Jack Russell Terrier Club of America). The Diggin’ West Challenge is held annually, where you and your terrier can compete in a variety of activities including, racing, agility, obedience, conformation and go to ground. Each year we support the local Madera Animal Shelter and Jack Russell Research Foundation. Our number one priority is preserving the natural hunting instincts of the Jack Russell breed. We have also committed ourselves to producing a correctly structured terrier based on the JRTCA breed standard, while not forgetting that this terrier is first and far most a hunting dog. Whether it is hunting, conformation, agility or obedience, we commit ourselves to raising our terriers with the love, attention and affection they need to become top competitors and loving pets. All of our Terriers are registered with the Jack Russell Terrier Club of America and we endorse the JRTCA Breeder’s Code of Ethics. Our terriers are BAER and CERF tested for hearing and eye defects. For more information go to the JRTCA.